Biscuit Mix Recall Announcement – According to a company press release dated December 21, 2016, House-Autry Mills, Inc., recalled some of its biscuit and cornbread mixes due to the potential for the products to be contaminated with Salmonella. 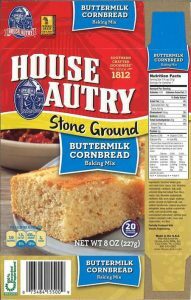 The recalled products include House-Autry Buttermilk Cornbread Mix, House-Autry Buttermilk Biscuit Mix, and House-Autry Cheese Biscuit Mix. The recall was initiated after it was learned that House-Autry had purchased ingredients from a suppliers whose milk powder, used in these products, may be contaminated with Salmonella. Salmonella is a bacterium capable of causing a serious and sometimes life-threatening infection known as salmonellosis. Symptoms of salmonellosis may include diarrhea (sometimes bloody), abdominal cramps, nausea, vomiting, fever, chills, headache, muscle pain, and joint pain. Symptoms usually appear within 6 to 72 hours after eating a Salmonella contaminated food. According to the U. S. Centers for Disease Control and Prevention (CDC) there are an estimated 1.2 million cases of salmonellosis in the U.S. each year, with approximately 400 of those cases resulting in death. The elderly, infants, and those with impaired immune systems are more likely to suffer severe illness or Salmonella complications. Please see Food Poisoning Lawyers NJ to learn more about food poisoning litigation. If you or a loved one is diagnosed with salmonellosis, are awaiting medical confirmation of Salmonella infection, or have a question regarding your legal rights, you can request a free legal consultation by calling Attorney Eric Weinberg toll free at 1-877-934-6274. Please visit Talcum Powder Cancer and Pulmonary Embolism Lawsuit to learn more about other areas of practice at The Weinberg Law Firm.